She moves through the seal colony on Namibia’s wild Skeleton Coast with purpose and focus, gingerly stepping around the adults who snap at her heels. She’s searching for smaller prey. Her name is Tosca. She’s a rare brown hyena, a long-haired, primeval-looking carnivore, unlike anything you’ve ever seen before. Following her is a young German field scientist, Ingrid Wiesel, who has now spent 17 years with Tosca’s clan, tracking, observing and learning everything she can about one of the world’s least understood, and most unusual predators. She is so dedicated to these animals that local people call her ‘the Hyena Lady’. Tosca is one of Ingrid’s favourites. She is an efficient and hard working hunter, and also a successful mother, who travels over 25 kilometers every day across one of the world’s harshest deserts to bring food home to her pups. But something is happening on the Skeleton Coast and Ingrid is concerned. The hyenas are leaving their beach front hunting grounds and moving inland. This includes Tosca who also vanishes from the beach. When Ingrid checks the den where Tosca raises her pups, she discovers that this place, too, is abandoned. Where is Tosca, and why did she leave? In this film Ingrid Wiesel sets off on a journey that takes her deep into the world of brown hyenas. She wants to find her favourite study animal. And she wants to discover what exactly has forced her to leave her traditional hunting grounds for a more difficult desert life. Finding Tosca is central to Ingrid’s mission, but finding a scientific explanation for the hyena’s change of behaviour is even more important. By better understanding the forces that are impacting on the lives of brown hyenas there’s a better chance of helping these rare animals. In her search Ingrid will discover that despite their remote setting in the world’s oldest desert, the Namib, these animals are being hit hard by climate change in ways that no one could have predicted. ‘Strandwolf’ will be the first in depth, high definition film about the secret lives of brown hyenas. 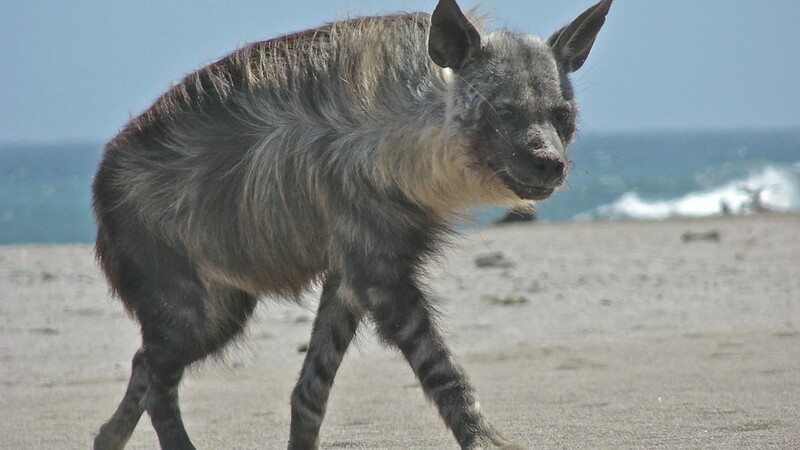 It will compare the very different behaviour of beach hunting hyenas like Tosca with those desert hyenas that live entirely inland. It will feature many exciting revelations that Ingrid has discovered from her 17 years field study. The vast beauty of the Skeleton Coast and the extreme nature of the Namib desert will be our stage. A passionate expert scientist will be our guide. The stars, of course, will be the carnivores that few of us have ever seen and know so little about.